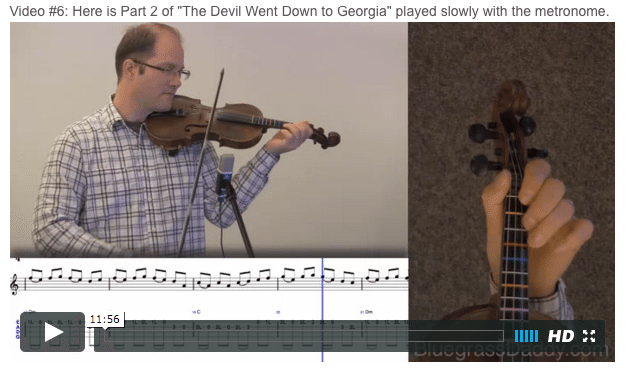 This is an online fiddle lesson for "The Devil Went Down to Georgia" by the Charlie Daniels Band. 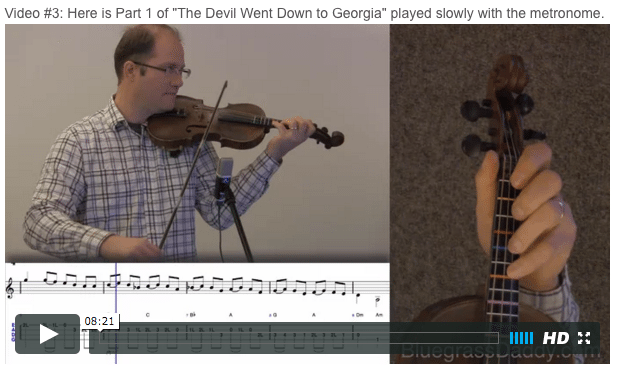 Video #1: Here is a video of me playing "The Devil Went Down to Georgia." The song is written in the key of D minor. 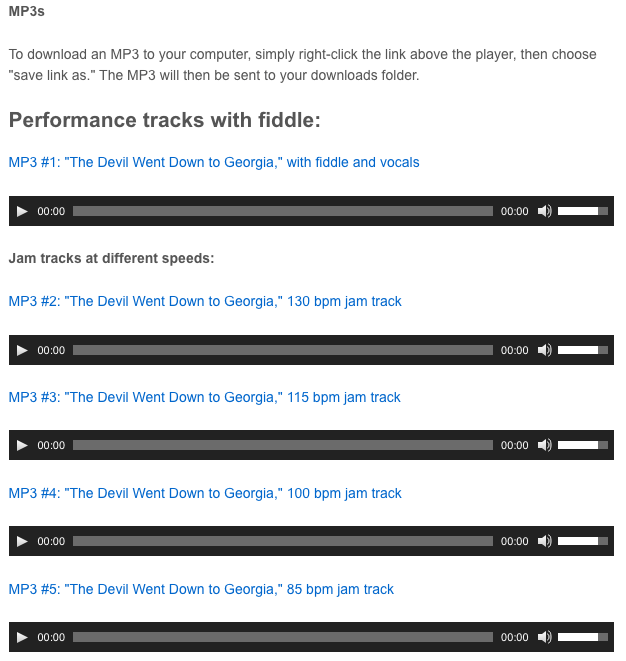 Vassar Clements originally wrote the basic melody an octave lower, in a tune called "Lonesome Fiddle Blues" released on Clements' self-titled 1975 album on which Charlie Daniels played guitar. The Charlie Daniels Band moved it up an octave and put words to it. 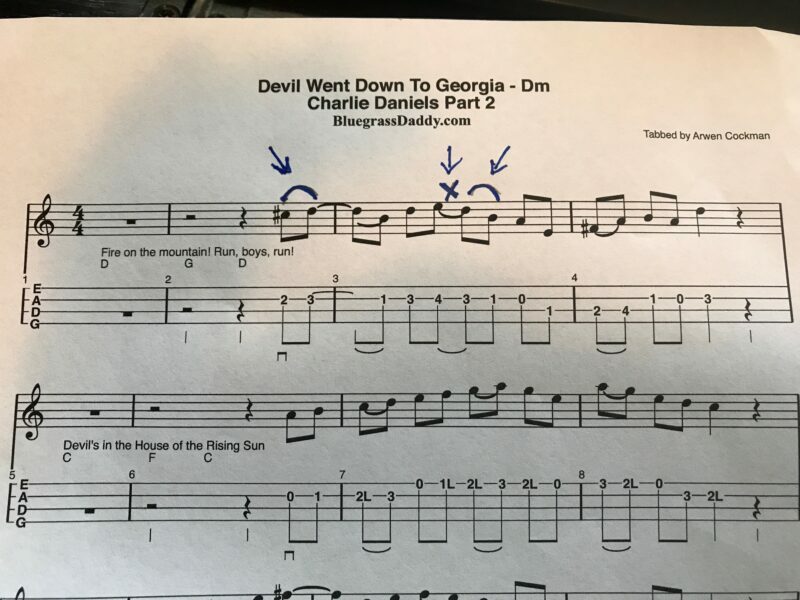 The song's verses are closer to being spoken rather than sung (i.e., recitation), and tell the story of a boy named Johnny, in a variant on the classic deal with the Devil. The performances of Satan and Johnny are played as instrumental bridges. The song was the band's biggest hit, reaching number three on the Billboard Hot 100. I'll make a bet with you"
Let me show you how it's done"
This topic contains 19 replies, has 11 voices, and was last updated by Fayew3 10 months ago. 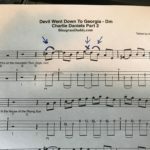 Charlie Daniels most famous song and one I get a lot of requests for. I hope you enjoy! Yeehaw John, that was great ! Cant wait, I ve always wanted to learn this one, and people ask for request also all the time, thank you so much ! I noticed 5 different shirts ! You must have spent a lot of time on this one , could tell by the number one quality in your playing , as always , and I love the devil John in red and the angel John in white on top of your shoulders , classic , reminded me of the Flintstones in that funny way . What a prize piece and lesson ! Amazing ! Oh gosh! This one would be a great thing to know…people love it. More work ahead…lol…keeping us out of trouble! I can’t wait to get the chance to start on this! Thanks, John…you make me feel so lucky! So many great learning opportunities! That was pretty neat…I’m glad in red had to go…lol. Finally got time to watch the video…the lessons…lol…one of these days! Wow. The lessons are awesome and I love the creative drama with the devil and angel. So excited for this lesson! 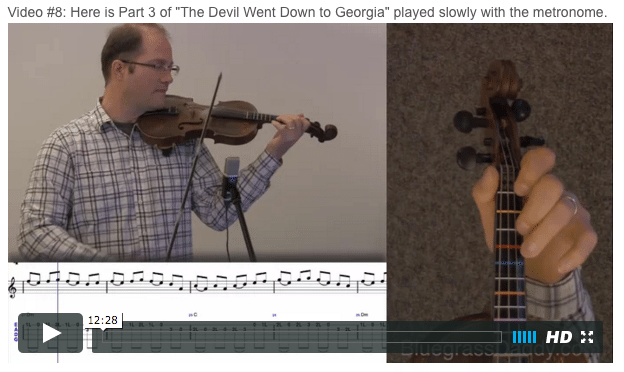 Haha both Johnny’s break and the Devil’s break have two fiddles, so I thought it would be fun to do the little shoulder-angel and shoulder-devil. Like the song, I guess they are also kind of a metaphor for spiritual warfare, lol. Hope to hear this one from someone in the Lion’s Den eventually! John this is just an awesome lesson on a great tune. Thanks again for enriching my life with all the great music. Johnny — This is possibly your most awesome video to date. Awesome and brilliant! If I keep it up, I hope to soon be rolling in the doh. Hi John. 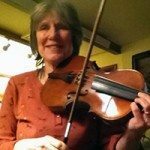 I’m new to this site and actually pretty new to this instrument. 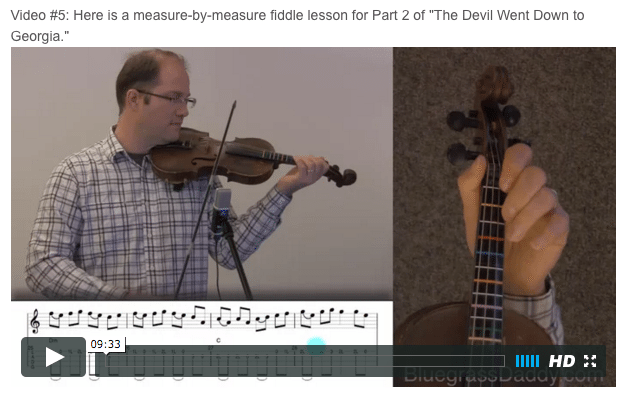 I know “The Devil” is a pretty challenging piece for a beginner, but I guess I like challenges. 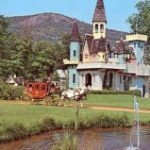 I have a question about the tabs for Part 2, and just reading the music in general. I attached a copy of “Part 2” with my notes. 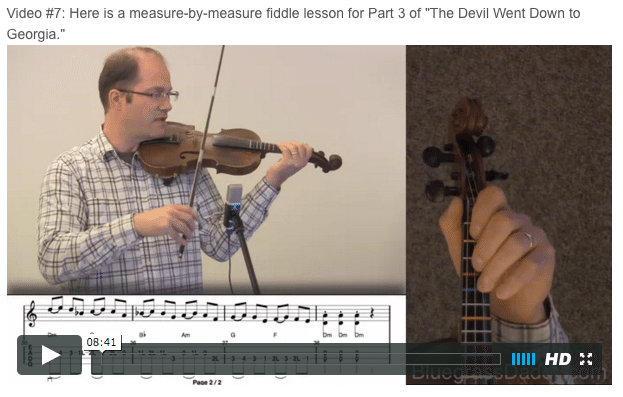 If I understand correctly, you’re supposed to play slurs/ties with one draw of the bow — is that correct? 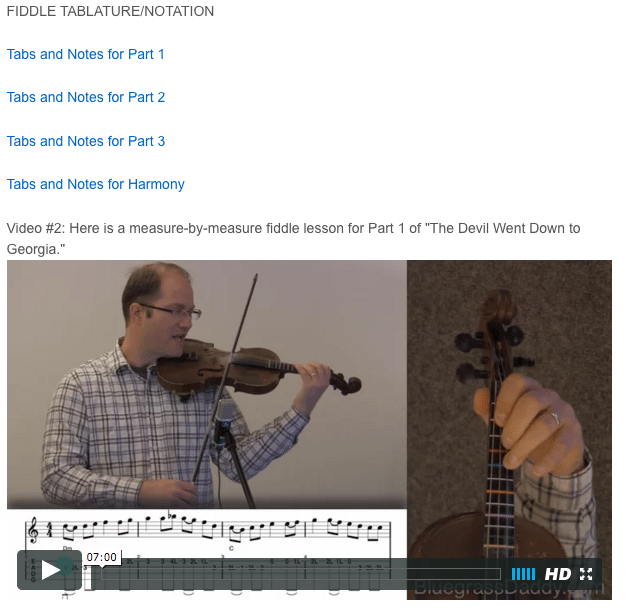 I noticed in video #6 that you play the first four notes all with one draw, even though the first two notes aren’t slurred (See my first arrow in the attachment.) Then although the 4th and 5th notes are slurred in the tabs, you use two strokes, and then slur the 5th and 6th notes (see the next two arrow). Is this a misunderstanding on my part? Or does it really not matter which notes I choose to combine in a single stroke? There was something similar in Part 1. As a fledgling fiddler I just want to make sure I don’t go down the wrong road. Thanks. Love the site!! Hi Rick, and welcome to the site! Great question. I will generally “suggest” slurs to you, but unless it is a straight Nashville or Georgia shuffle, I rarely stick to my own suggestions. However, when you are beginning, it can be a big help to stick to the tabbed slurs until you are ready to start trying your own thing. When you watch an orchestra, every bow is going the same direction. It’s really a beautiful thing. However this NEVER happens in bluegrass. We’re pretty wild and free over here! I know you all will love this. Julia is 11 years old and a member here at BGD. This is her playing “Devil Went Down To Georgia” using the BGD backing track. She is going to be amazing! Wow…way to go, Julia!!! Great job! John, that was an absolutely fascinating production. Wow, am I impressed! What a great video. I wish Charlie Daniels could see it. 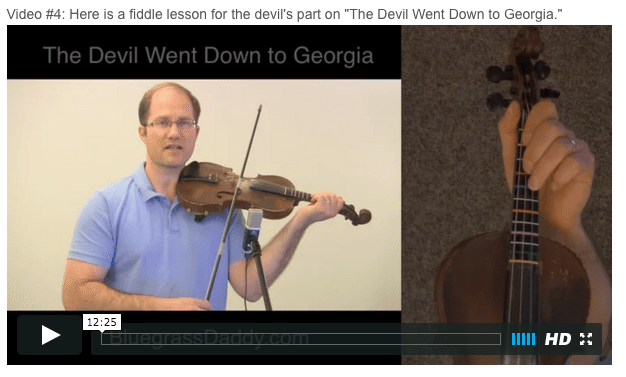 I have a Charlie Daniels story to relate. He performed once up in New York State at the Old Time Fiddlers Hall of Fame in Osceola. It was on the huge lawn just across the road from the HOF and there were several hundred plastic chairs reserved in the front right by the stage and I asked what they were being reserved for and the answer was: Charlie set them apart, free of charge, for the US Army soldiers from Fort Drum in Watertown to enjoy his concert au gratis. I never forgot the generosity of Charlie. He’s a wonderful man. I got to visit with him later on. What a fun time. John, your video does him justice. Thanks Fred! That’s a great story about Charlie Daniels. I have never met him but everyone says he is a true gentleman. That was incredible!!! Rivaled the original and I really enjoyed listening to it. 🙂 Glad I’m subscribed so I have the chance to learn it. Julia rocked it! I love it!! !